Is Apex Learning Virtual School accredited--AdvancED, UC, NCAA, College Board®? AdvancEd – We are committed to high standards, academic excellence, and success for all students. Since 1999, Apex Learning has been accredited by AdvancEd. This certificate of accreditation recognizes ALVS for promoting and maintaining a well-balanced educational program and for exceeding standards considered essential for quality education. UC – The University of California (UC) has certified Apex Learning standards-based courses in “a-g” instructional areas to fully prepare students for first-year university programs. Can students earn a diploma at Apex Learning Virtual School? A weekly progress report is emailed to designated adults once a week for the duration of the course. Designated adults–we call them ‘coaches’–can be parents, guardians, local school staff, tutors, or mentors. The coach can use the report to help their student stay on track and motivated. ALVS research has show that adult engagement is a key indicator of success for online students. To enroll, click the Enroll Now button at the upper left-hand corner of this screen. 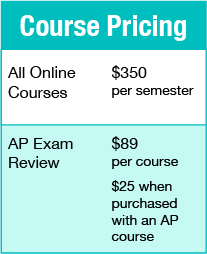 Choose a course, add it to the shopping cart, and continue with the checkout process. You will receive an email with instructions after your registration is received. Students complete courses through an online learning platform, where they work at their own pace toward scheduled due dates. A virtual teacher is assigned to the student facilitates each course. Students have 24/7 access to the course content and are not required to be online at a specific time, unless they wish to meet with their online teacher via phone or video chat. ALVS students can access online tutors as part of the cost of the course. Live Tutor Chat is available Monday through Friday, 5 a.m. – 5 p.m. Pacific Time.